This is a wonderful idea and I think it's absolutely perfect and elegant! You want something proven which can't be done without quite a bit of effort. To actually prove this, you would need to hold the EF at least 2 times without this in effect, the first year nobody will know about it and be pissed, causing massive lines for the Dealer's then at initial opening, leaving half the line to miss out on the Fursuit parade + being in the way of such. The Second year, the problem would stay the same, leaving those problems in place while we can then actually see the number. So even with the proof, the surrounding problems would still not be alleviated, which means massive crowds at the opening time, and that's contra-productive to everyone. As it was said before, it's the task of the specific Artists to work with the system, it's well known and many adapt, some don't. Getting a space for a commission at a con is definitely easier then otherwise, that's why the Supersonsor is in high regard. So, given all that, I would rather want to hear the thought process of why you think it even would raise the amount of Sponsors rather then lower it, which in this direction makes far more sense, as the incentive for buying a Supersonsor is rather to get better stuff then not buying it because you don't like the system. Love it. Doubt EF would change anything regarding this, but I will suggest it in other conventions. Sorry to say but "nope". I know that in the US cons handle the money and pay out the artist minus the states' tax. In Germany Eurofurence don't touch the money at all - every artist has to do his/her own taxes as a freelancer, artist or whatsoever. This also includes the artists from outside Germany. And a lot of artists do daily slots. So most of the supersonsors and sponsors are after the limited items like prints or t-shirts. So if you really like a commission from an artist you storm in early at Friday or Saturday or ask if they are willing to do a sketch commission outside the convention. Most of them do. You just have to ask nicely. The word "tax" wasn't used here in the literal way. In this context it is just "An extra payment that you have to make in order to commission", sorry if this was unclear. If it is still possible to get commissions/short supply items, this would mean that the supersponsor perk is diminished in this regard and will not lure people to super sponsor (As previously suggested, move the early access to Friday). I agree that it is difficult to prove which is why we can't assert that it's true nor that it is false. So instead we should focus on what people/the con gains if the early access is moved to Friday Vs. what they lose. If you can get low-stock items on Friday then moving this perk to Friday shouldn't reduce super sponsor count. If you can't get them, then the other points about unfairness / commission tax / getting your friends to do it for you still stand. I don't have a statistical significant pool of opinions, all I can say is that I and other people I know can and will super sponsor when this unfair perk is removed while we currently don't do so. I'll never understand why taxing limited items is so important in order to get more sponsors. If I ever needed to get something that's only available in the den and is in limit quantity, I'd ask a sponsor friend if I didn't sponsor. Kinda feels like everyone can get along just fine with or without it nowadays, as the fandom market is so big and diverse. I do like the idea of a quiet sponsor hour inside the den, but that could be anytime like was suggested. "You don't have any arguments against the current system"
1. If people can still get commissions and hard to get items even without sponsoring, then there is no reason that this perk will cause people to super-sponsor in the first place. 2. If people can't get commissions and hard to get items without sponsoring then it's unfair, and they can still get their super-sponsor friends to do it for them instead of super sponsor themselves (The incentive behind super sponsoring is helping the con first, not buying the perks. Reward the ones that give extra, don't penalize the ones who don't). 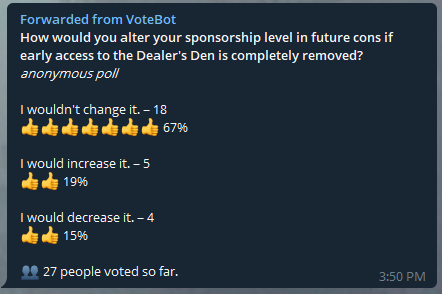 "You even removed your poll because the results didn't suit you"
The strawpoll was removed because it was too easy to cheat on, the results on Telegram suited me well before it was removed by the poster. There isn't a significant amount of attendees supporting your claim. There isn't also a significant amount that oppose it, post an official poll or after con feedback form if you want any validity to this argument. Your arguments aren't controllable, they are simply envy or blind idealism. Calling it envy is flat out ad hominem and disrespectful, especially when it comes from an official. Not only that but even if it was true (It isn't, I hope I don't need to show my paycheck or something), I could still get a super-sponsor friend to get me stuff. Even if this wasn't an option and it was flat out envy - it doesn't make the arguments weaker. Attack the arguments, not the one who presents them or his motives. Blind idealism? How can you assert that, maybe it's realistic? If you want to assert that, get us to fill an official feedback form. I don't understand the personal attacks regarding this topic or any other feedback. The reason I put time and effort to write this, answer other people and debate here is to help the con. Isn't the mindset of the con "Maximize the amount of fun people have while sticking to the available budget"? Everything I said is inline with this ideal. I believe that perk was not put in place as a way to motivate people to sponsor the con. It's simply a way to give back to the people that participate in allowing the con to happen in the first place. If that in turn attracts more sponsorship, then great! If not, it doesn't matter because that's not its goal in the first place. You can get access to limited items even without going through early access, this has been demonstrated time and time again. It would be a problem if (Super)sponsors snatched everything and left regular attendees with nothing. I believe everyone agrees with that. But thankfully that's not the case. So where is the issue? You can also choose not to use this perk if you find it unfair. I thus still fail to see your reasoning behind "I would like to supersponsor but I won't do it unless that perk is removed". Feels like blackmail more than real commitment to help the con. All the other ways to give back to people that allow the con to happen are great and even having the same exact perk but on Friday would be perfect. None of the other perks affect the other attendees like that - You can still view events from non-priority seating places for example. Since not all limited access items are available without early access (I know for a fact I would have missed one without sending a super sponsor) it is unfair towards the ones that don't super sponsor (Unless of course they just get a friend to do it for them, completely missing the entire point). "Fairness" here is invoked in the wrong context. (Super)sponsors have access to perks regular attendees don't have access to. This balances the fact they help allowing the con to happen in the first place. Is that fair or unfair? Completely up to subjectiveness and interpretation. With the same reasoning, you could say the (Super)sponsor-only items are "unfair" to the regular attendees, because only (Super)sponsors have access to them. And that's an objective fact, compared to the DD items which rarely, if ever, become unavailable for regular attendees. Why are you thus campaigning to remove the early DD access perk but say nothing about the (Super)sponsor exclusive items? Because you value DD items more than convention-exclusive items. That is personal and has nothing to do with the concept of fairness. I thus still fail to see why you deploy so much energy against that "perk". It's been demonstrated time and time again it doesn't prevent non-sponsor attendees from getting the item they're after. And as Alpha_Ki suggested, nothing prevents you from going to an artist/vendor and discussing the situation with them before or during the con, as many are already adopting a system of daily slots/stock. In such cases, if you really wanted a particular item, nothing would prevent you from queuing early on Friday and getting the same result as queuing early on Thursday without early access would. I'll repeat this again - if you get perks such as a towel or a neat bag, this doesn't affect me in such a negative way (Missing limited availability stuff in the dealer's den) so this is a weak analogy. If you argue that I won't miss the stuff in the dealer's den regardless (Because it would still be available after early access) then there is no reason not to move this perk to Friday. You deem it a "weak analogy", because you value the DD items more than the convention-exclusive items. You definitely have the right to feel that way - but that doesn't make it a universal truth. No, I deem it a weak/false analogy because that's how it is defined by logic. In reality, A is not too much like B (Early access isn't like other perks because when another person gets a towel or a beg it doesn't affect me at all but if they get early access I might get robbed out of an item I wanted).